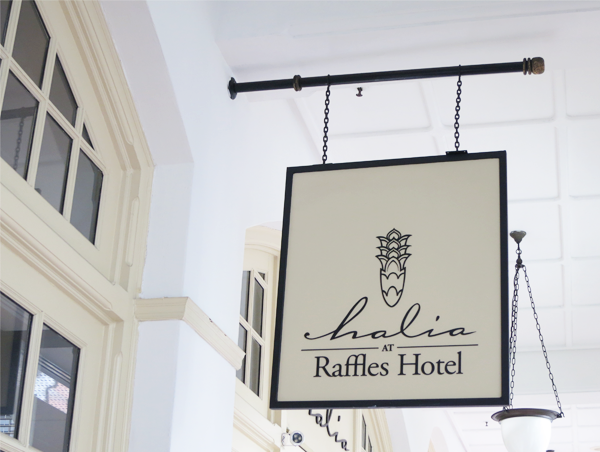 The Halia at Raffles Hotel is the sibling of the award-winning Halia at Singapore Botanic Garden. 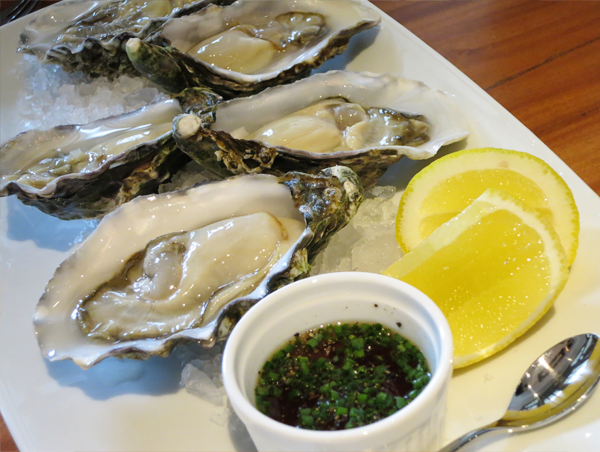 Opened last November the restaurant sits in the premises of the old Seah Street Deli. 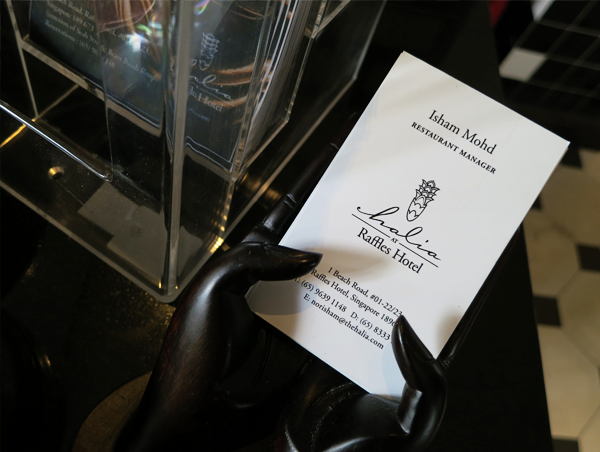 I dropped by the restaurant for a food tasting session at the end of April. Coincidentally, it marked the end of the first month of work for me. So yay, it made a really satisfying celebration... For the tummy! This celebration wouldn't have been made possible without Fel dear and LeRoy from Food News. Thanks so much, you two! The restaurant can house as many as 100 famished tummies. 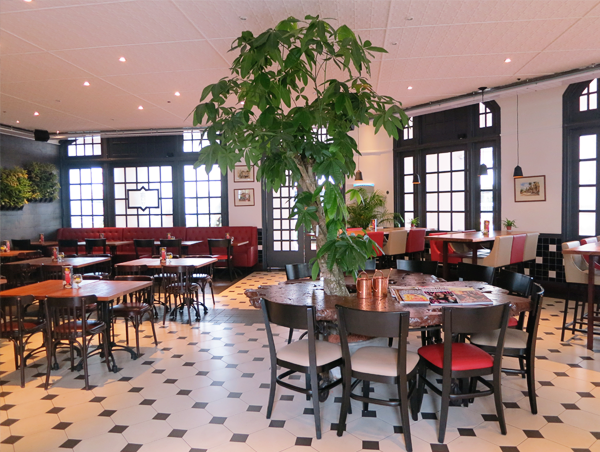 Dotted with lush greenery, plush red sofas and wooded tables, it has a really relaxed ambiance. The flooring reminds me of American Soda Fountains (Think: Pop Tate's Chocklit Shoppe from Archie Comics.). 'Tis the perfect hangout for family and friends! Unlike the branch at Singapore Bontanic Garden, The Halia at Raffles Hotel offers a weekend brunch specials menu during the weekends (Of course!) and on public holidays. Frequent changes are made to it to kill monotony and to cater to our ever-demanding appetites. The food tasting session kicked off with sides from the à la carte menu. 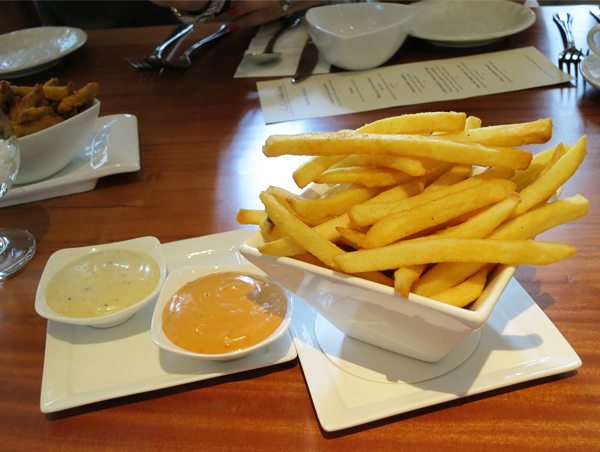 We first had the Potato fries, truffle aioli & piquant mayo ($8). For the uninitiated, truffle aioli (The white dip!) is a French dip that is frequently used for fries. It is very similar to mayonnaise, in terms of texture, but with more flavour (More citrusy!). The taste of the truffle oil was detectable; strong but not too overwhelming. I'm not sure what exactly went into this orange dip but the typical piquant mayo is made with red/ black pepper and hot sauce. Hence, this was spicy... But just a tad! I usually give 'spicy' a wide berth, but this was manageable and I actually preferred it to the former! 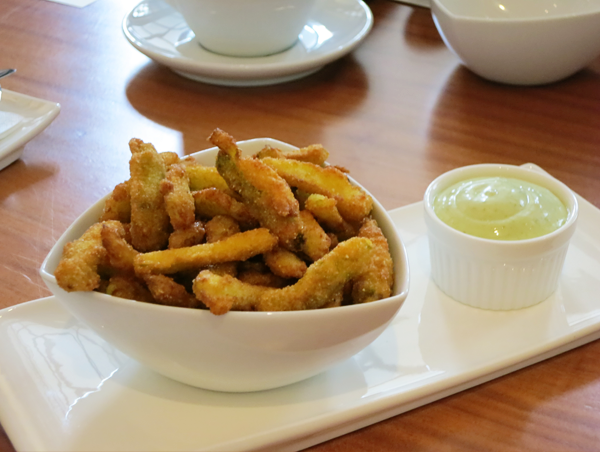 Next came a plate of Polenta coated asparagus, with basil lemon mayo ($9). Polenta is grounded corn and this was generously dusted around each crispy strand of asparagus. This dish was akin to eating 'healthy chips' and I loved the light polenta coating (Breadcrumbs usually get me jaded after a few bites.)! The basil lemon mayo was a great pairing, adding the perfect touch of tanginess. A glass of refreshing Halia Berry Mint ($12) was my choice of comma in the string of food dishes. It was a spritely concoction of ginger, mint leaf, fresh blueberry and well, sprite. Sure provided me a great respite from the heat! And now, for the mains from the brunch specials menu! 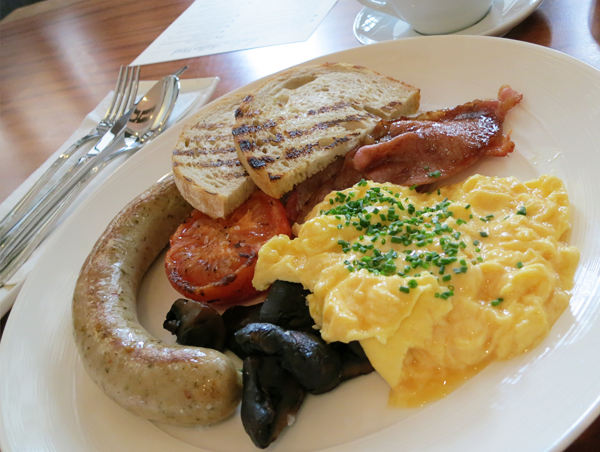 The Grilled breakfast with any style eggs (Fried, poached, omelette or scrambled) ($23) makes a hearty meal for any time of the day. We had it with poached and scrambled eggs. The poached eggs were nicely done, breaking apart to form a nice and runny pool of gold. The scrambled eggs were adequately fluffy. Both sat well on top of the slightly charred toast. 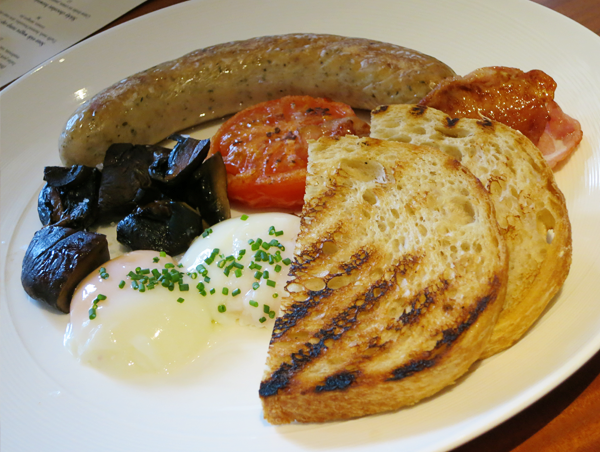 The sausages were firm and tasty and was a nice salty addition to the meal. Mushrooms were delightfully juicy (I wish the portion wasn't so paltry! But then again, they are just the sides. I do adore my mushrooms very much!) and didn't have the too-raw-taste-like-soil taste. 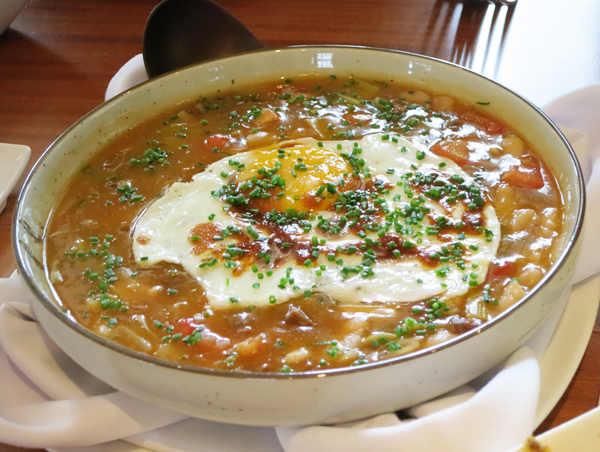 The White bean Iberico chorizo leek stew ($16) is a bowl of smoked chipotle sauce, tomato and fine herbs, topped with a sunny side up. An interesting dish with flavours bursting in every corner. Unfortunately, I don't quite fancy tomato-based dishes so ummm... I can't really judge this fairly. 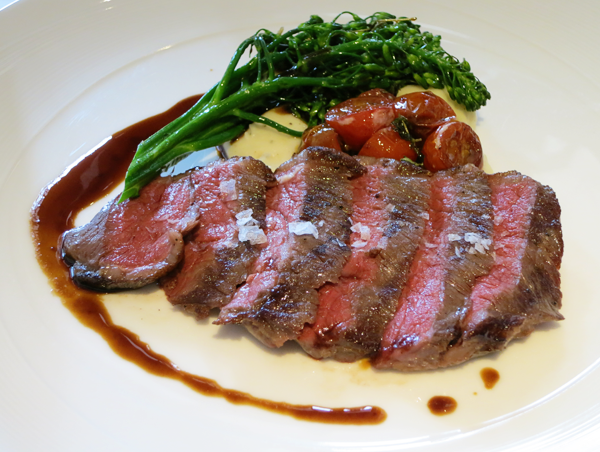 My favourite dish is the Sous-vide wagyu rump cap ($36). Thick slabs of succulent beef sat on truffle mash that was so sweet and heavenly! I kept going "I really love this mashed potato!" like a broken record. I mean, I have never tasted mashed potato like this before! And I really love potatoes too! But yes, of course I love the beef slices as well! They were tender and a joy to chew. This dish stayed in my head for weeks! And I amwas not even a fan of beef! It was really quite a waste because these were specially flown in that morning and the (very cute) chef specially included them into the session. Eeps! :\ But I felt a little better after he admitted that he wasn't a fan of oysters either. Heh. Every meal must end on a sweet note and that was what we did! Except that we ended on 3 sweet notes. We first had the very fluffy Pancakes ($12). It came with interesting bricks of bacon butter, fresh strawberries and purée, which was eagerly drizzled all over. 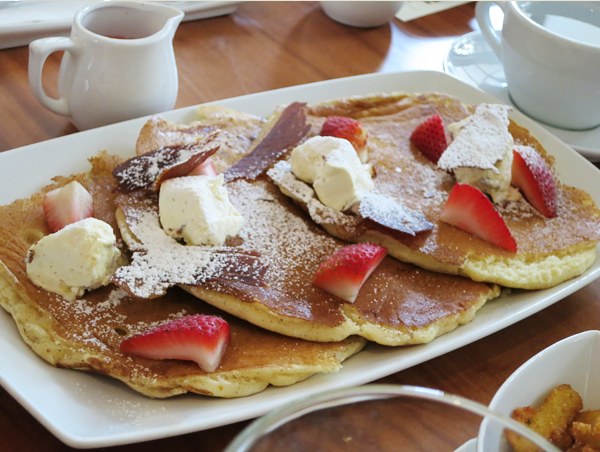 Pancake lovers will definitely want to check this out... Just because of the bacon butter! 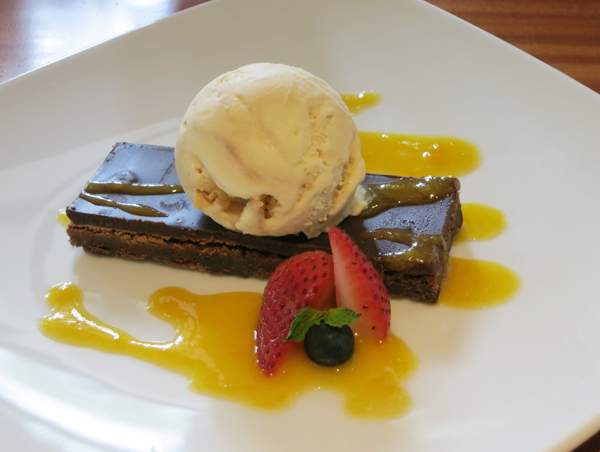 The Sticky chocolate brownie ($12) was escorted by a scoop of crème brûlée ice-cream and passionfruit sauce. The brownie was chock-full of chocolate goodness and wasn't too heavy. The escorts were unusual for me but they complemented the brownie very well. 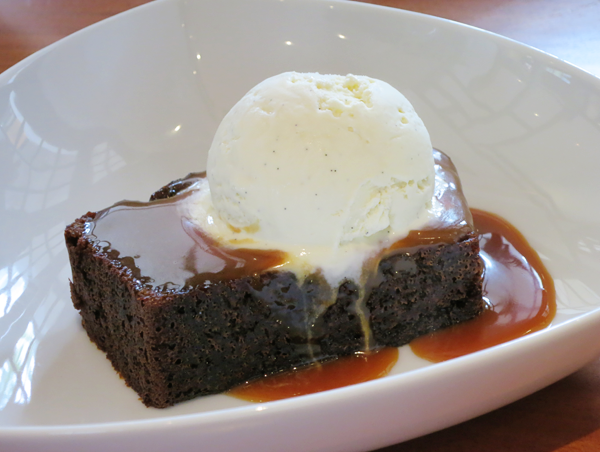 Last but not least, we had the Sticky toffee pudding ($10). This came waddling in butterscotch sauce and sat under a vanilla scoop. It must be a sight to behold for chocolate lovers but it was a tad too sweet for me and was rather overwhelming. Perhaps it was because I was completely stuffed already! Often, great ambiance does not come with great food. 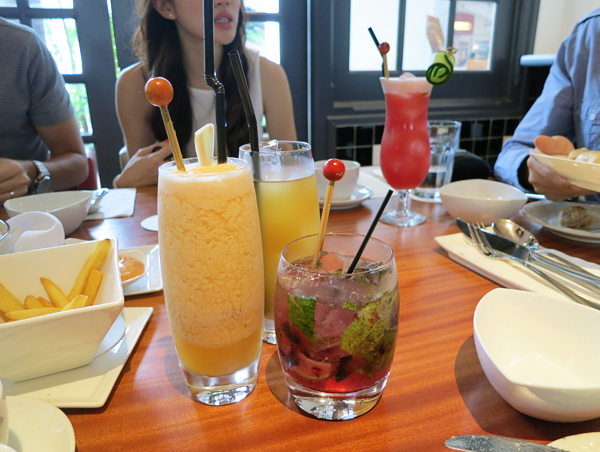 But The Halia at Raffles Hotel proves to be an exception, albeit pricey. I thoroughly enjoyed the mains... So much so that I brought the siblings and the boyfriend there for a treat (After payday! Haha.). The brother and boyfriend liked their Grilled breakfast with eggs. And the sister and I (OF COURSE!) got the Sous-vide wagyu rump cap. However, I thought the beef slices were tougher than I remembered. But anyway, we ordered the Potato fries, truffle aioli & piquant mayo and a couple of drinks too. The total bill was about $180.